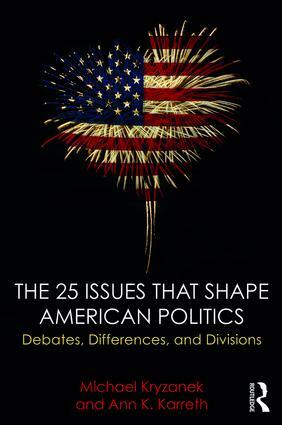 This book is organized to examine the major subjects taught in American politics through the lens of twenty-five hot button issues affecting American politics and policy today. These key issues reflect the ideas, principles, concerns, fears, morals, and hopes of the American people. The authors argue that these issues are the heart and soul of the American political system, serving as the basis for the disagreements that drive citizens, public servants, and elected officials into action. Examines 25 issues in light of the 2016 presidential election and beyond. Up-to-date chapters reflect important developments in the arenas of money and politics, immigration, health care, race relations and civil rights, gun control, and gay rights in particular. Includes international coverage with recent and ongoing events surrounding Iran, Syria, Israel and Palestine, and China. A chapter on Russia puts recent developments in Syria, Ukraine, Crimea, and the "near abroad" in context with US foreign policy. Are We a Nation United or Divided?